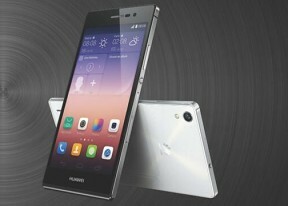 The Huawei Ascend P7 comes with 2G/GPRS/EDGE and 3G network support. 3G comes with HSPA+ - for up to 42Mbps downlink and 5.7Mbps uplink. Then, there is also the latest LTE (Cat. 4, 150Mbps down / 50Mbps up) network connectivity. Local connectivity is covered by dual-band Wi-Fi b/g/n with DLNA, so you can easily play media (photos, videos, music) from DLNA-enabled storage devices or push content from your phone to a DLNA TV or multimedia player. There's also NFC support, and the Magic Tag lets you program the two NFC tags which were included in the retail package of the Ascend P7. You can set your tags to do all sorts of actions, including adjust sound levels, activate Do Not Disturb, launch apps, and more. The Ascend P7 also supports USB host so you can attach USB flash drives or connect mice/keyboards. Like most droids nowadays, the Ascend P7 comes with two browsers to handle your web surfing needs. The stock browser offers largely the same functionality as Google's bundled Chrome browser, but we found the latter to be a more capable performer. Chrome also lets you sign in with your Google account and access open tabs and history from other sessions. Perhaps the highlight of Huawei's homebrewed apps is the Phone Manager. It lets you control all sorts of features from call privacy and Do Not Disturb settings, to phone optimization and app permissions, to network and battery usage. It features a one-touch optimization feature that frees up memory space and gives you settings recommendations for maximum battery performance. It's quite a slick feature that few manufacturers offer. The Huawei Ascend P7 comes with Polaris Office 4.0, which handles document editing with ease. It supports Word, Excel and PowerPoint docs (both the 2003 and 2007 versions), it also opens PDF files and it doubles as a file explorer. You do get a proper file explorer too - it has two tabs that divide your content between categories and a file explorer for internal and external storage. The app also handles ZIP and supports batch operations. Huawei has included some nifty camera features in the Ascend P7, some of which are accessed as individual apps. The Magnifier is especially nifty for looking at stuff up close, while the markedly female-targeted Mirror apps lets you get a quick look at yourself, with included brightness adjustments and zoom options. When it comes to getting around, the Ascend P7 comes with Google Maps and Navigation. The app offers much of the same functionality as its web-based counterpart, although you will need a data connection to take full advantage of the navigation features. Street view mode with digital compass enabled is an especially cool trick.